Image Source: Instagram/Vin Innocente via HuffPo / Café Mom. 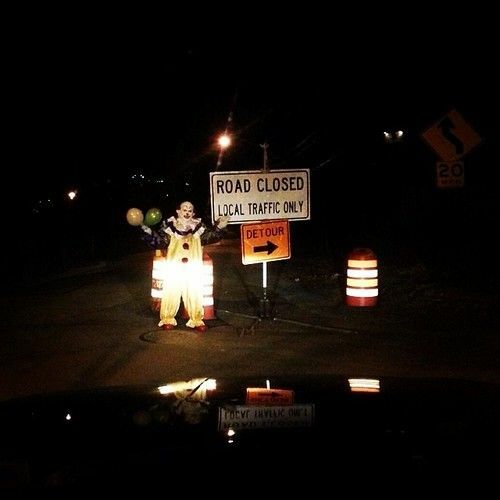 "A mysterious clown has been roaming the streets of Staten Island and freaking out local residents. Staten Islanders have been posting pictures and videos on social media of a person dressed up like a clown wearing a yellow outfit, red shoes and a mask while holding balloons and waving to the cameras, the Staten Island Advance reported. 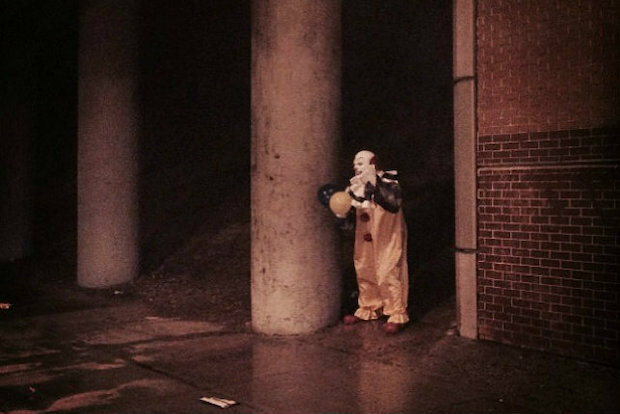 The clown has been spotted at night near the Richmond Valley and Grasmere train stations and in front of a Chinese restaurant during the day on Richmond Avenue, according to the Advance and online posts. 'I wish I was joking dude, it scared the heck out of me,' Michael Levy posted on his Instagram photo of the clown behind a tree at night. 'I thought it was like some dummy or cardboard standup thing at first until he pointed at me.'" Image Source: Instagram/Robert Privitera via HuffPo.